I have always had a suspicion in school that traditional marking policies were not benefiting students in the way they should. Colleagues and I had concerns that the different ways in which we had been providing feedback were not only perceived poorly by the students but were potentially ineffective in ensuring progress. We found that previous methods both undermined the purpose of marking and feedback and had a demoralising effect on the teachers who were spending three or more hours an evening doing it. During October and November 2015, the Department for Education undertook the Workload Challenge to investigate the tasks perceived as causing the most unnecessary workload. In the top three was marking (53 per cent). Three reports were then produced by three DfE-commissioned expert working groups, one of which was Eliminating Unnecessary Workload Around Marking. At Bedminster Down, Pete Headeach, one of our assistant heads, chose to use his Master’s dissertation as an opportunity to research more effective ways in which we could assess and give feedback. We hoped to create a system that would engage students more positively in the process while encouraging greater progress. This coincided with a national increased focus on teacher wellbeing to create a new way of approaching feedback. The steps were radical and interesting enough to spark media interest and debate, where we found ourselves explaining the realities of teacher workload and the end of meaningless written comments. We wanted to provide feedback that was given much sooner after work had been produced, was less reliant on written comments that might not be understood, and didn’t always rely on just a mark. Additionally we wanted to spend some of the saved time on more informed planning that made a greater difference to our students’ progress. We call our new method of feedback Assess–Plan–Teach, aimed at only providing feedback that is well-timed, provides support and challenge and allows teachers to spend more time planning effective lessons. It is very much based on Ross McGill’s “Mark. Plan. Teach”, but adapted for Bedminster Down School. Feedback and assessment is now carried out in three ways: Live Marking, Impact Marking, and Summative Assessments. This is sitting with a student and talking through a piece of work, celebrating good work and identifying areas for improvement. It is a verbal dialogue in which students have input in their assessment and can respond to feedback immediately, asking questions where they feel appropriate. IM1 – a pupil has not understood a topic and will need more support. IM2 – a pupil has an understanding but needs more time to embed it. IM3 – a pupil has a clear understanding so need either more challenge or an extension to move on. Summative assessments take place to provide benchmarks for progress each term. Both Impact Marking and Live Marking were trialled with groups of teachers and departments and views on traditional versus the new marking system were collected from students using student voice and video interviews. Over a four-month period the proposed model was explored during a whole-school roll-out and in subject bases in order to help departments work out how they could best apply it in their subject. Group CPD and individual feedback was made available for staff, in preparation for a September 2017 launch. Implementation in some subjects has been challenging and in particular we found that teachers had to make a big cultural shift from spending ages on correcting every single spelling or arithmetic error to focusing on the main learning objective to feed into the impact code. This was especially true in more literacy-heavy subjects such as history or languages. Another challenge has been where subjects are very content-heavy and we’ve had to strike a balance between “getting through the curriculum” and finding time to really focus on pupil understanding with Impact Marking. To overcome this we have been flexible with the specific method and frequency of marking, depending on the subject. In maths, my own subject, we are developing the live marking discussions to provide a greater focus on coaching – developing discussions on how an answer was achieved rather than just talking about how to do the questions that were wrong. I have had some pleasant surprises with the introduction of Assess–Plan–Teach. 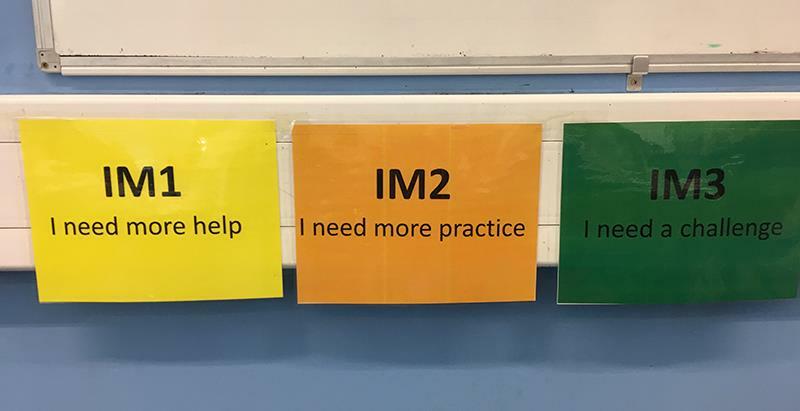 Surprisingly, students really don’t mind being IM1 as they know it means they will get the extra support they want and need. There is a desire throughout the school for involvement in live marking too, as our students really like talking to their teacher about their work and relish the opportunity to experience this. Run a trial: find a small group of teachers across subject areas to see how it might suit your own curriculum, teaching and learning priorities and schemes of work. Keep it fluid: encourage an experimental atmosphere towards the introduction so it is deemed okay if things don’t go to plan. Joint planning: we found teachers appreciated joint planning opportunities in departmental time to share attempts at implementing the new scheme. Open doors: it is the best way to see it in practice – especially if a colleague thinks they have cracked it. Reinforce the motivations: it is a focus on moving on student learning and teacher wellbeing to benefit the whole-school community. Our next steps are to further embed the model so students are more secure and understand how feedback might be slightly different according to the subject. We also want to encourage greater take-up of our online tracking system so parents can be engaged more regularly on their child’s progress. It is still fairly early days for our new model but it has been welcomed by teachers, parents and students. Energy that would have gone into marking through the evening is now being used to plan lessons and teachers welcome the increased opportunities to get to know their students’ strengths and weaknesses better. Megan Arnold is an assistant head and maths teacher at Bedminster Down School, a 950-pupil secondary school in south Bristol.